A key skill of a successful customer service professional is an ability to be flexible and use different approaches in different situations, that is, to tailor the way they respond to customer needs based on particular context of the situation. Probably anyone who’s ever worked with people would tell you that different techniques work for different customers. It’s essential to recognize how a customer would like to be treated from the first point of contact so that you could choose the most suitable approach in line with your own experience and intuition. Some people tend to think and act quickly, while others like to take more time to make informed decisions. Some people are more friendly and enthusiastic, while others prefer to stay more reserved. The more adaptive your communication skills are, the more you are likely to develop a rapport with a variety of customers and deal effectively with a diversity of situations, — and the less are the chances of misunderstanding, miscommunication or frustration on the customer’s end. Although most of us learn it through trial and error, the adapting skills can be taught, just like any other key skill or competency. In this article I would like to draw your attention to the Social Styles Model developed by psychologists Roger Reid and John Merrill in the early 1960s. Since then the model is widely used to help predict human interactions in business relationships. Hope my overview of the Social Styles Model will help you get some new and useful insights on how to improve your performance and be more effective in your interactions with others. The Social Styles Model is the result of work of two American psychologists Roger Reid and John Merrill who conducted a research for a large insurance company aimed at finding out inter-linkages between various behavioral markers and leadership potential to let the company create a culture of highly effective management and successful leadership. And although the attempt to predict leadership potential through behavioral assessment was unsuccessful, the research resulted in an accidental discovery of something else. In fact, their personality assessment based on three behavioral dimensions – assertiveness, responsiveness and versatility – turned out to be really helpful to predict person’s key interpersonal weaknesses and strengths, the most suitable supervision model, most challenging job tasks and more appropriate ways to direct their energy, their role as a team member among many other useful things. Tested and validated with a vast variety of teams and projects from different fields and industries, the model’s predicative value proved to hold true for both work and non-work situations, for cultures inside and outside the US. Today the model is widely used as a practical tool for achieving higher productivity and better results in sales, management, human resources and many other fields. And one of the most important aspects of it is that people can get a better understanding of how others see them and how they can make their relationships with people of other social styles more productive and enjoyable. According to Merrill and Reid, people can be divided into four personality types: Amiables, Expressives, Analyticals, and Drivers. Although people often feel that they have some characteristics of each type, one personality style type is dominant in defining our behavior. Each style can be described by its own unique language, habit of thought and approach to business. And that’s how the model gives us valuable insights and clues to recognizing what personality type we are dealing with and how it needs to be handled. The chart below is taken from Journal of Technology and Science Education, vol.2, #2 (2012), it shows the two-dimensional space defining personality traits analyzed in the study. 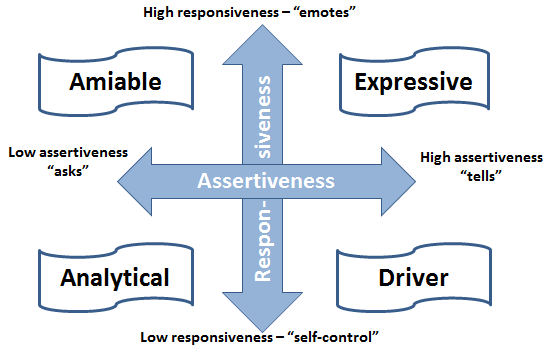 The “assertiveness” axis indicates the individual‘s tendency to impose their ideas or to go along with the ideas of the group. The “responsiveness” axis indicates the tendency to display one’s emotions, as opposed to emotional self-control. People with an amiable personality are known for being friendly, supportive and people-oriented. They value co-operation, personal security, acceptance, respect opinion of others, and like to develop relationship before conducting business. They are usually quick to reach a decision, but need some time to build rapport. Being outgoing and social, Amiables enjoy working with other people in a team effort, rather than individually, and tend to focus on team results. Customer Service Tip: As customers, Amiables expect you to be considerate and friendly. They are likely to chat for a while before getting down to business. When providing customer support to people with an amiable personality, focus on why your product, solution or advice will meet their needs. They would also appreciate if you share some similar positive experiences from other customers. Those with an expressive personality are fast-moving and spontaneous, confident and enthusiastic. They enjoy involvement, excitement and creativity. Expressives like to come up with new ideas, but they may not have the ability to see their ideas through to completion. They dislike details, and tend to focus on opinions and stories rather than facts and data. Customer Service Tip: As customers, Expressives tend to be slow with their buying decisions. They typically expect you to spend some time socializing with them before getting down to business. But once you get right to the point, keep their interest by focusing on the big picture, and avoid spending too much time on details. People with an expressive personality usually would like to know who uses your product or service, and are more likely to buy products and services that are recommended by people they know. Also, be ready to showcase your best testimonials. The analytical personality type is usually described as cautious and thoughtful. 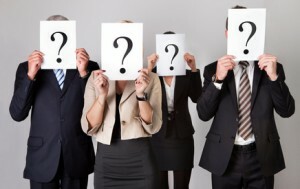 Analyticals prefer to make informed decisions. They value numbers, statistics and love details. People with an analytical personality are inclined to formalities, standard operating procedures, organizational rules and conventional ways of doing things. When it comes to making their choices, Analyticals aren’t much interested in what other people think, they rely on their own opinions and cold facts. Customer Service Tip: When you deal with analytical customers, give clear and detailed responses and use step-by-step procedures. Providing data, facts or instructions in a direct organized manner is the best way to support people with analytical personalities. Show them how your service or product will meet their needs. Use specific examples and let the facts speak for themselves. Also, be ready to offer background material and research data they might need to draw their own conclusions and give them time to put everything together on their own. The person who has a driver personality can be described as direct, determined and action-oriented. Time is of the essence for Drivers, and they usually make rapid decisions. Drivers talk fast, get right to the point, strive for results and react quickly. They enjoy being in control and doing things their own way. Drivers can become impatient with those who don’t keep up with them. Customer Service Tip: As customers, Drivers expect you to value their time and separate wheat from the chaff. Drivers want solutions and answers to their problems now. Talk about results and benefits, but be concise and professional. If you need to convince them, show them facts that can be grasped quickly and easily. If you’d like to learn more about using Social Styles Model to better serve your customers, including more specific tips for each personality type, read “Hospitality Sales: Selling Smarter” by Judy A. Siguaw and David C. Bojanic. I would also recommend you to check out the article “How To Deal With Difficult Customers” by Peter Urs Bender. There you’ll find some helpful examples and an interesting thorough summary of how famous personality theorists have approached the four most common personality types. Have you ever heard of the Social Styles Model before or have you intuitively come up with a similar idea of your own? 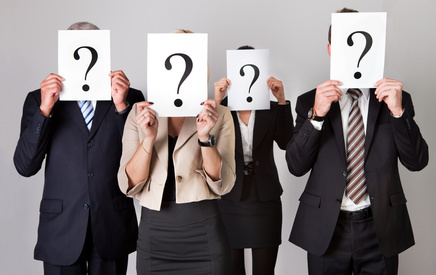 What are the clues you use to recognize customer’s personality type and what are your best tips on how to deal with each of them? You are welcome to leave a comment if you have something to share. And as always, thank you for reading our blog! This entry was posted in Articles, Tips and Tricks and tagged customer personalities, customer social styles, tailor customer service. Bookmark the permalink. Great article, really interesting to read your thoughts. Our team have been advised to “mirror” the customer they are speaking to as much as possible, use similar language and quickly interpret how they choose to interact during business conversations – we have found it really useful. Really a nice post you have posted in this blog and really it helped me out to tell the proper meaning of the tailor. Very much important in tailoring is the personality it shows the person nicely! Thank You!